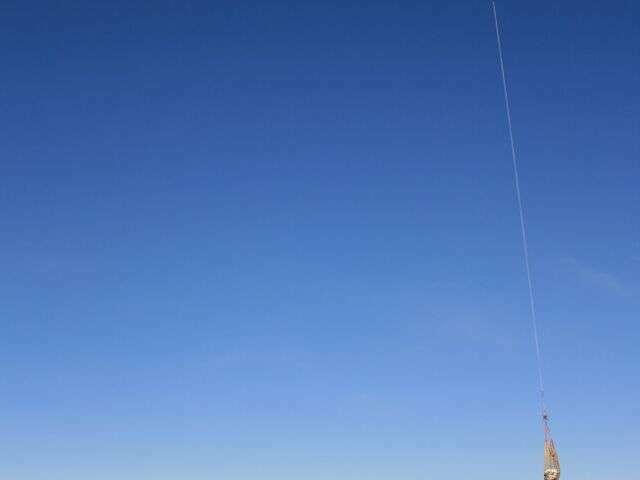 About 10 years ago, Peter Hews stumbled across some bones sticking out of a cliff along the Oldman River in southeastern Alberta, Canada. 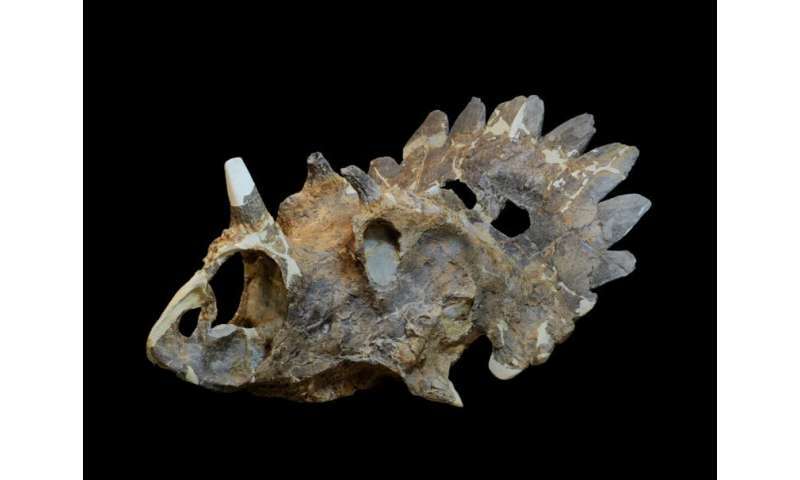 Now, scientists describe in the Cell Press journal Current Biology on June 4 that those bones belonged to a nearly intact skull of a very unusual horned dinosaur—a close relative of the familiar Triceratops that had been unknown to science until now. "The specimen comes from a geographic region of Alberta where we have not found horned dinosaurs before, so from the onset we knew it was important," says Dr. Caleb Brown of the Royal Tyrrell Museum of Palaeontology in Alberta, Canada. "However, it was not until the specimen was being slowly prepared from the rocks in the laboratory that the full anatomy was uncovered, and the bizarre suite of characters revealed. Once it was prepared it was obviously a new species, and an unexpected one at that. Many horned-dinosaur researchers who visited the museum did a double take when they first saw it in the laboratory." What made this new horned dinosaur distinctive was the size and shape of its facial horns and the shield-like frill at the back of the skull. 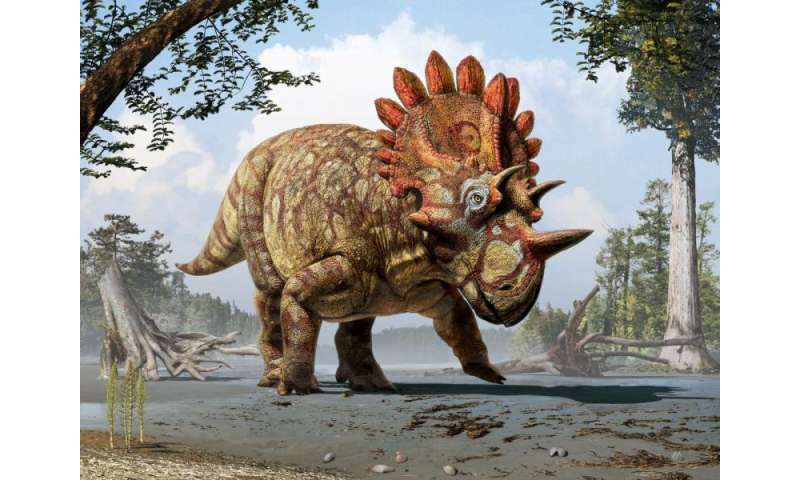 This new species is similar in many respects to Triceratops, except that its nose horn is taller and the two horns over its eyes are "almost comically small." But the new dinosaur's most distinctive feature is that frill, including what Brown describes as a halo of large, pentagonal plates radiating outward, as well as a central spike. "The combined result looks like a crown," he says. A photograph of the skull of the new horned dinosaur Regaliceratops peterhewsi (Royal Tyrrell Museum of Palaeontology 2005.055.0001) in oblique view. Credit: Photo Courtesy of Royal Tyrrell Museum, Drumheller, Alberta. Photo by Sue Sabrowski. Brown and study co-author Donald Henderson named the new dinosaur Regaliceratops peterhewsi, a reference to its crown-like frill and to the man who first found and reported it to the museum. Despite the formal name, the scientists say they've taken to calling this dinosaur by the nickname "Hellboy." While this new dinosaur is intriguing in its own right, Brown and Henderson say what's most significant are the implications for the evolution of dinosaurs' horned ornamentation. It's long been known that horned dinosaurs fall into one of two groups: the Chasmosaurines, with a small horn over the nose, larger horns over the eyes, and a long frill, and the Centrosaurines, characterized by a large horn over the nose, small horns over the eyes, and a short frill. "This new species is a Chasmosaurine, but it has ornamentation more similar to Centrosaurines," Brown says. "It also comes from a time period following the extinction of the Centrosaurines." A photograph showing the helicopter lift of a jacket containing part of the skull of the new horned dinosaur Regaliceratops peterhewsi. Credit: Photo courtesy of Royal Tyrrell Museum, Drumheller, Alberta. The researchers say they hope to uncover more Regaliceratops peterhewsi specimens. They'll also be working on digital reconstructions of the skull, noting that, though intact, the fossil has been deformed after 70 million years in the Rocky Mountain foothills. "This discovery also suggests that there are likely more horned dinosaurs out there that we just have not found yet, so we will also be looking for other new species," Brown says.